Simic is the former poetry editor at the Paris Review, and a recipient of the Pulitzer Prize for The World Doesn’t End (1990). 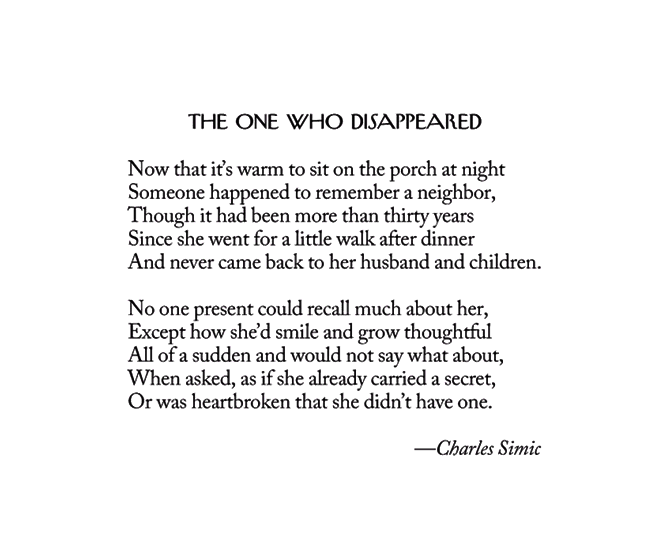 My interest in terse prose and narrative poetry is no secret, and so I’m not surprised by my admiration of “The One Who Disappeared.” To my mind, it recalls Robert Lowell’s “Skunk Hour” – depicting, as it does, the mystery inherent in warm summer nights in quiet suburban settings. As I did when writing of “Skunk Hour,” I’ll once more link such imagery to the eerie cinematic photographs of Gregory Crewdson.